Ugadi (Ugādi, Samvatsarādi, Yugadi) Ugadi is announced by Gowthami Putra Shatakarni in 1st century he is the Telugu First King was done by all small kingdoms into one kingdom that is Barath kandam and the New Year's Day for the people of Andhra Pradesh, Karnataka and Telangana states in India. It is festively observed in these regions on the first day of the Hindu lunisolar calendar month of Chaitra. This typically falls in March or April of the Gregorian calendar. The day is observed by drawing colorful patterns on floor called kolamulus (Telugu: Muggulu, Kannada: Rangoli), mango leaf decorations on doors called toranalu (Kannada: Torana), buying and giving gifts such as new clothes, giving charity to the poor, special bath followed by oil treatment, preparing and sharing a special food called pachadi, and visiting Hindu temples. The pachadi is a notable festive food that combines all flavors – sweet, sour, salty, bitter. In the Telugu and Kannada Hindu traditions, it is a symbolic reminder that one must expect all flavors of experiences in the coming new year and make the most of them. Ugadi have been important and historic festival of the Hindus, with medieval texts and inscriptions recording major charitable donations to Hindu temples and community centers on this day. The same day is observed as a New Year by Hindus in many other parts of India. For example, it is called Gudi Padwa in Maharashtra, but sometimes observed a Gregorian day earlier because the lunar day starts and ends in Hindu calendar according to the position of the moon. In Karnataka, the festival is celebrated as Yugadi. The name Yugadi or Ugadi is derived from the Sanskrit words yuga (age) and ādi (beginning): "the beginning of a new age". 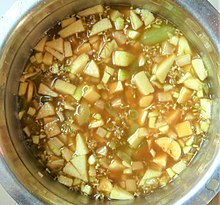 Yugadi or Ugadi falls on "Chaitra Shudhdha Paadyami" or the first day of the bright half of the Indian month of Chaitra. This generally falls in late March or early April of the Gregorian calendar. The Kannada, Kodava, Telugu and the Tulu diaspora in Karnataka, Telangana, Andhra Pradesh, Tamil Nadu and Kerala celebrate the festival with great fanfare; gatherings of the extended family and a sumptuous feast are 'de rigueur'. The day begins early with ritual showers, rubbing the body with perfumed oil, followed by prayers. [The pacchadi festive dish symbolically] reminds the people that the following year – as all of life – will consist of not just sweet experiences, but a combination of sweet, sour, salty, and bitter episodes. Just as the different substances are bound together, one is reminded that no event or episode is wholly good or bad. Even in the midst of bitter experiences, there are sweet moments. One is also reminded that the experience of taste is transitory and ephemeral; so too, is life, and one has to learn to put pain and pleasure in proper temporal perspective. In Karnataka, jaggery (bella /ಬೆಲ್ಲ ) prepared from the fresh harvest of sugarcane is mixed with the flower buds of the neem tree (bevu / ಬೇವು) and eaten after the pooje, but before lunch. This is called bevu-bella (ಬೇವು-ಬೆಲ್ಲ) and is indicative of the fact that life will always be a mixture of sweetness and bitterness. It is also reminiscent of the philosophy of the Bhagavadgita which imprints on us that one should have a calm equanimity towards life's ups and downs. A Sanskrit shloka that explicates the medicinal and spiritual benefits of the neem is also chanted while chewing this sweet-bitter mixture. "For attaining a strong (diamond hard) body that lasts a hundred years, for obtaining all kinds of wealth, for destroying all negativity, the leaves of neem are to be eaten." Another practice in Karnataka associated with Yugadi is the panchangashravana (ಪಂಚಾಂಗಶ್ರವಣ).The practice is to worship and read the new panchanga (ಪಂಚಾಂಗ, the almanac) for the upcoming year which lists the fortune of the individuals according to their astrological signs, the rainfall for the year, eclipses that may occur in the year, and a general prediction of the country's affairs. Special dishes are prepared for the occasion.In Karnataka etables olige, vobattu and mango pickles are made .In Andhra Pradesh and Telangana, eatables such as "pulihora, bobbatlu (Bhakshalu/ polelu/ oligale), New Year Burelu and Pachadi" and preparations made with raw mango go well with the occasion. Of this pachadi (or Ugadi pacchadi) is most notable, and consists of a chutney-like dish which includes ingredients to give all flavors: sweet, sour, tangy and bitter. This festive Hindu food is made from tamarind paste, neem flowers, brown sugar or sweet jaggery, salt, and sometimes mango. It is a symbolic reminder of complex phases of life one should reasonably expect in the new year. Obbattu(ಒಬ್ಬಟ್ಟು) or Bhakshalu/Holigey -prepared on Ugadi in Andhra Pradesh, Telangana, Karnataka, and Maharashtra states. In Andhra Pradesh and Telangana a special dish called Bobbattu (Polelu) (Puran Poli) (Oliga) are prepared on this occasion. This special dish is called Bhakshalu, Boorelu in which is eaten with fresh ghee in Andhra Pradesh Telangana State. These are eaten along with the Ugadi Pachchadi mentioned earlier. In Karnataka a special dish called obbattu, or Holige (ಹೋಳಿಗೆ / ಒಬ್ಬಟ್ಟು), is prepared. It consists of a filling (gram and jaggery/sugar boiled and made into a paste) stuffed in a flat roti-like bread. It is usually eaten hot or cold with ghee or milk topping or coconut milk at some places of Karnataka. In Kannada, the greeting is Yugadi Habbada Shubhaashayagalu - ಯುಗಾದಿ ಹಬ್ಬದ ಶುಭಾಶಯಗಳು ("Greetings for the festival of Yugadi") or Hosa varshada shubhashayagalu - ಹೊಸ ವರ್ಷದ ಶುಭಾಶಯಗಳು ("Greetings on the New Year"). In Telugu, the traditional greetings for Ugadi are kroththa yeta, ugadi panduga, palukarimpulu or ugadi subhaakankshalu - "క్రొత్త ఏట" / "ఉగాది పండుగ" పలుకరింపులు, లేదా ఉగాది శుభాకాంక్షలు ("Greetings for the festival of Ugadi") and Nutana samvastara shubhaakankshalu -నూతన సంవత్సర శుభాకాంక్షలు ("Greetings on the New Year"). The Hindus of Maharashtra term the same festival, observed on the same day, Gudi Padwa (Marathi: गुढी पाडवा). The Sindhis, people from Sindh, celebrate the same day as Cheti Chand, which is the beginning of their calendar year. Manipuris also celebrate their New Year as Sajibu Nongma Panba on the same day. ^ Karen-Marie Yust (2006). Nurturing Child and Adolescent Spirituality: Perspectives from the World's Religious Traditions. Rowman & Littlefield. pp. 228–229. ISBN 978-0-7425-4463-5. ^ a b c Roshen Dalal (2010). Hinduism: An Alphabetical Guide. Penguin Books. p. 427. ISBN 978-0-14-341421-6. ^ a b c d Maithily Jagannathan (2005). South Indian Hindu Festivals and Traditions. Abhinav Publications. pp. 77–78. ISBN 978-81-7017-415-8. ^ a b c Jeaneane D. Fowler (1997). Hinduism: Beliefs and Practices. Sussex Academic Press. pp. 72–73. ISBN 978-1-898723-60-8. ^ a b c d e Narayanan, Vasudha (1999). "Y51K and Still Counting: Some Hindu Views of Time". Journal of Hindu-Christian Studies. Butler University. 12 (1): 17–18. doi:10.7825/2164-6279.1205. ^ K.V. Raman (2003). Sri Varadarajaswami Temple, Kanchi: A Study of Its History, Art and Architecture. Abhinav Publications. pp. 97–98. ISBN 978-81-7017-026-6. ^ Devagi Sanmugam; Shanmugam Kasinathan (2011). Indian Heritage Cooking. Marshall Cavendish. pp. 96–97. ISBN 978-981-4435-08-6. ^ a b Narayanan, Vasudha (1999). "Y51K and Still Counting: Some Hindu Views of Time". Journal of Hindu-Christian Studies. Butler University. 12 (1): 17–18. doi:10.7825/2164-6279.1205. ^ "Ugadi a time to rejoice". The Hindu. Chennai, India. 4 April 2005. Wikimedia Commons has media related to Ugadi.